Photograph of the interior of the Nand Bhawan at Dig in Rajasthan, taken by Raja Deen Dayal & Sons in the 1890s, from the Curzon Collection: 'Views of places proposed to be visited by Their Excellencies Lord & Lady Curzon during Autumn Tour 1902'. The Nand Bhawan is one of four main pavilions in the 18th-century garden palace of the Sinsini Jat dynasty, built by Suraj Mal (r.1733-63). The pavilions stand on each side of a char bagh (formal garden divided into four quarters) with fountains. The Nand Bhavan (c.1760) is a large single-storeyed, rectangular building on a terrace at the north edge of the garden. 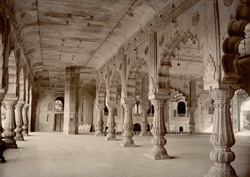 This is a view of the interior of the central hall showing the arcades of pillars inlaid with pietra dura and cusped arches decorated with scrollwork.